Tri Star CNC Services LLC provides superior repair services to CNC machine customers. Our technical phone support allows us to help you solve minimal problems your machine may be experiencing when you don’t feel it is necessary to send your malfunctioning parts in. We can also tell you if the problem you are having with your CNC machine requires more attention than over the phone support. When we receive your damaged or malfunctioning parts, our highly trained repair technicians will do an inspection to determine whether or not repairs need to be made or can be made. If your CNC machine’s FANUC parts are damaged beyond repair or you don’t have the time to wait for repairs to be made, replacement parts are available on an exchange basis. Whether you have a broken control board, servo motor, spindle motor, the power supply, or any other CNC machine component, our experienced FANUC repair technicians will turn around a perfectly functioning module in little time. 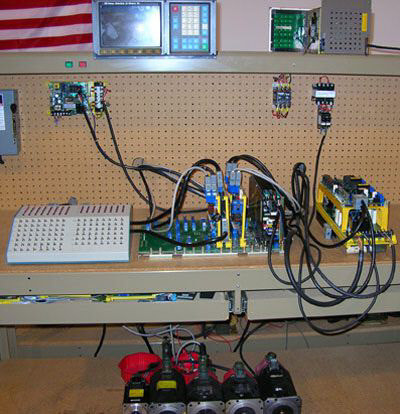 Contact the CNC repair specialists at Tri Star CNC for expert repair of FANUC servo drives and spindle drives. We also offer a wide selection of FANUC parts for sale from our exchange stock . If your CNC machine controls or sub-assemblies are malfunctioning, send them to our expert CNC machine repair technicians at Tri Star CNC Services, LLC. We have the experience and equipment to repair this exhaustive list of FANUC CNC modules and parts. Servo drives are designed to coordinate communication between the control board and the servo motor. The drive amplified the power level signal to a level that controls the servo motor. A sensor reports the status of the motor, and the drive alters the voltage frequency going to the motor to keep the motor functioning as it is intended. When your machine is not functioning properly, alerting you to overload alarms, or showing any other abnormal sign of operation, it should be sent into a qualified repair technician for inspection. Spindle drives work to maintain consistent speed and torque in a CNC machine, controlling the high speed AC motors in spindle drive applications. They minimize variation in torque and speed using digital signal processors. When spindle motors decelerate, their spindle drive pushes electrical energy back into the line to continue power. When these parts malfunction it can result in an over current alarm or abnormal operation of your CNC machine. Untrained staff attempting to repair FANUC modules can cause serious damage to your machine and render it nonoperational. It’s no problem when you trust in Tri Star CNC Services. With many years servicing FANUC robots and their critical components, we’ve had exposure to all sorts of FANUC alarm codes and what they mean for your CNC machinery. Give us a call and we’ll help you diagnose the component(s) at fault. Tri Star CNC Services stocks several repaired units available for purchase on an exchange basis. So when you cannot wait for your machine to be repaired, we can give you a replacement in exchange for you broken unit and you can get your machine back to proper operation fast. In addition to this, Tri Star CNC Services treats all units sent in for repair as an emergency repair. On most items our turnaround time is 36 to 48 hours after receiving the approval of (quote appraisal) repairable unit. Our repair and test procedures either meet or exceed those currently established at Fanuc America. Our expert technicians will take the utmost care in repairing your malfunctioning unit, and will return it to you operating at maximum efficiency. When FANUC machine control parts are sent in for repair, our technicians replace the high failure electrical components, along with replacing the faulty components in your machine when needed and at no cost to you. This ensures your machine will continue to operate properly for a much longer period of time. Tri Star CNC Services provide the best FANUC and CNC machine repairs and make each repair a priority so you get you units back quickly and your machine can resume normal operations. FANUC robots are issued commands from the programming language Karel, written for highly specific manufacturing/production task. Robots rely on clean code and perfectly functioning electronic components to work flawlessly. FANUC robotics rely on a network of intercommunication between programming languages, controllers and physical parts to execute a task. Malfunctioning FANUC electronic components like servos and spindle amplifiers threaten the integrity of the process and put FANUC robots at a standstill. We’ve got the ability to repair these critical components and boast an exchange stock to help you get back into working order ASAP. When your CNC machine has a constant need for FANUC parts replacement, ask TriStar CNC what we can do to keep your modules working longer. Our custom FANUC parts development allows us to engineer specific components with high failure rates used in several FANUC servo units. Our expert technicians install higher quality replacement components with a longer mean time between failures, as compared to the components originally installed in FANUC parts. When our repair technicians are fixing FANUC parts, they automatically replace the high failure components whether or not they are the cause of the original failure. If the smaller components of your CNC modules fail regularly, it may be more cost effective to have us look for a better solution. Between engineering better performing FANUC part solutions at lower prices and proactively replacing high failure rate components in the parts our technicians repair, we offer the best repair services and solutions for CNC machine FANUC parts. We provide the best value in the market place for all CNC/FANUC parts and repairs. Our prices are usually lower than other FANUC parts and repair centers, and we provide the best warranty for our repaired and exchanged parts! Tri Star CNC Services goes further than other FANUC repair companies to deliver the greatest possible value, even custom engineering replacement FANUC parts at significant savings over original manufacturer parts, and proactively replacing high failure rate components before they fail. Please check on price, lead times, and availability on our "Parts" tab. IF NO PROBLEM IS FOUND WE ONLY CHARGE A NOMINAL CLEAN & TEST FEE! !